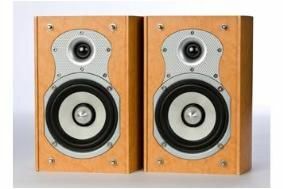 Roth reveals second-generation OLi speaker range, from £109 | What Hi-Fi? The OLi 10 (£109) replaces the OLi 1, and is a two-way bookshelf design standing just 21cm tall. It has a 25mm silk-dome tweeter and 10.2cm woven glass hybrid mid/bass driver. Next up is the OLi 20 (£149), again a bookshelf model, but with a bigger cabinet and larger 13.3cm mid/bass unit. A trio of floorstanders completes the line-up: the OLi 30 (£299) with two 13.3cm mid/bass drivers, the OLi 40 (£399) with a pair of larger 16.5cm mid/bass drivers and the flagship OLi 50 (£799) with four 16.5cm mid/bass units. All the new floorstanders have improved DALtech (Dead As Lead) damping technology, intended to eliminate distortion caused by the speaker's own energy. The Roth OLi range is on sale now, and is available in Birds Eye maple and black finishes.